Oh when oh when should you start to worry about the newborn schedule/routine? Do you start to implement things right away, or do you wait before you worry about it? And if you wait, how long do you wait? How do you know when it is time to start a routine? Parents often worry about these questions–even parents who are not having their first baby. We want to get it right, but we don’t want to over-stress. We want to enjoy our newborn baby time, but we don’t want to encourage bad habits that will make life hard for baby down the road. 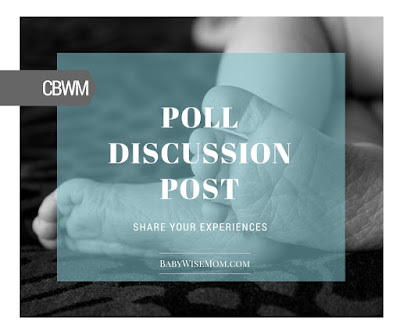 What age did you start to implement a routine/schedule with your newborn? Was this a good age, or do you think you went too early or too late? What drove you to start the routine/schedule at this age? What did you early days of implementing routine/schedule look like? How did following a routine/schedule evolve over the newborn weeks? What age did you start to implement a routine/schedule with your newborn? We started lightly at four weeks. We breastfed and my milk had come in. She was already circling around a consistent daily pattern, which matched what Babywise said, so we struck when the iron was hot.Was this a good age, or do you think you went too early or too late? I think it was perfect. Follow the child, but also guide the child. The important thing is to be observant.What drove you to start the routine/schedule at this age? My sister-in-law had done something similar successfully, starting pretty early, based on the child's hunger needs, etc. My LO was already forming a sleep/eat/play routine, so we capitalized on it.What did you early days of implementing routine/schedule look like? The early days, babies are so sleepy anyway, so the key was watching for sleepy signs and really getting her to sleep on time, as well as not killing yourself over sometimes when it didn't go perfectly.How did following a routine/schedule evolve over the newborn weeks? Of course, you stick to it less strictly, then get better and better. You get better at seeing sleepy cues and figuring out how your baby will even sleep at all – what kind of surface, swaddling, etc.Would you do it differently next time? No. Any words of advice? Really watch the child, work together to get the routine started. Also, the husband needs to be on board. That way, if things go awry, you can encourage each other rationally, move on together and keep getting better at managing LO's sleep. What age did you start to implement a routine/schedule with your newborn? * With my 2nd and 3rd I started the routine right away. In the hospital I nursed on demand but made sure they did not go longer than 3 hours between feedings. I got them used to being swaddled and laid them down awake but drowsy (if not holding them while they slept). The routine was very loose in the beginning but I definitely followed an eat, wake, sleep routine and watched for sleepy cues. Was this a good age, or do you think you went too early or too late? * I think this was perfect. With my first we waited until around 4 weeks and had to undo some bad habits which was much more difficult and involved lots of crying (baby and me). By implementing eat, wake, sleep from the beginning I never had to use cry it out with my 2nd and 3rd babies. They learned to fall asleep on their own from the beginning and didn't rely on being rocked or held. What drove you to start the routine/schedule at this age? * After raising a babywise baby it was second nature to start with a loose routine from the beginning. I knew the benefits of babywise and also knew how difficult it was to break bad habits. What did you early days of implementing routine/schedule look like? * I would nurse baby when she woke up. There was no set schedule but within a couple of weeks they were easily eating every 2.5 to 3 hours around the clock. After feeding I would change diaper and try to have some wake time (although in the beginning they were usually ready for bed after the diaper change). I would do a simple bedtime routine…swaddle, song, prayer and then lay down. If they woke "early' (within 2 hours of previous feeding) I would attempt to get them back to sleep either by rubbing their forehead, or holding them.How did following a routine/schedule evolve over the newborn weeks? * The routine evolved into a more "set" schedule by 3 months of age. At that point feedings and naps were very predictable.Would you do it differently next time? * Every baby is different but I would start out the same way next time and adjust if needed for baby's temperament.Any words of advice? * Start as you mean to go on. Try not to create habits you will later have to break. But also be flexible and enjoy your baby. My 3rd and (most likely) final baby is a perfect babywise baby but she was also held a ton. There were always a couple of times during the day in the very beginning where she did not sleep well on her own. It worked out the older ones were usually sleeping so I would hold her and enjoy the sweet newborn snuggles. I knew she would eventually outgrow the phase and she did. 1. What age did you start to implement a routine/schedule with your newborn? I had twins so we started immediately. When I fed one, I would wake up and feed the other. 2. Was this a good age, or do you think you went too early or too late? This was great for us. And the only way we'd get any sleep between feedings.3. What drove you to start the routine/schedule at this age? All the twin moms I knew told me it was best to get on a schedule.4. What did you early days of implementing routine/schedule look like? We ate A LOT. I kept thinking that it was going to be nice when they started eating every 3 hours instead of every 2 hours. It also took a while to get the hang of breastfeeding so eating took a long time. I'd say at about 8 weeks old, feeding became easier and faster.5. How did following a routine/schedule evolve over the newborn weeks? I remember at 8 weeks old going from 8 feedings to 7 feedings (make that 16 to 14) in 24 hours. Wow, that was a life changer. 6. Would you do it differently next time? Nothing :)7. Any words of advice? Now my girls are 15 months old and they tell me when it's time to eat/sleep/play. I'm so grateful I helped them benefit from the structure that comes with the schedule! They are happy and well adjusted! What age did you start to implement a routine/schedule with your newborn?Right away in the hospitalWas this a good age, or do you think you went too early or too late?It was great! With all three children this resulted in naps that didn't replace night sleep, so longer stretches at night. It also gave me a place to start.What drove you to start the routine/schedule at this age?I didn't know how else to do it! Before children I was very scheduled, so it was very natural to me.What did you early days of implementing routine/schedule look like?Mostly just nursing every 3 hours during the day and putting down to sleep when drowsy. I let all three children sleep as long as they like overnight.How did following a routine/schedule evolve over the newborn weeks?As they woke up I had to encourage nap time more and actually have wake times :)Would you do it differently next time?I wouldn't Any words of advice? As you grow out of the newborn stage, don't stress so much about getting "perfect" naps. Yes, it's nice, but just take it one day at a time. What age did you start to implement a routine/schedule with your newborn? We started EWS every 2.5-3 hrs as soon as we got home. We had twins and they were both so sleepy in the beginning and lower weights so we had to wake to feed them. Fast fwd to 5/6 weeks and we started having lots of tummy troubles as most parents find. The naps were tougher but we still fed on schedule and tried to get them to nap as best we could with as little intervention as we felt was best as this age.Was this a good age, or do you think you went too early or too late? It worked really well for us and getting them on a schedule was KEY. Even people against schedules even parent directed like BW says, will say to get twins on a schedule from the start. What drove you to start the routine/schedule at this age? Twins, the need for sleep, trying to manage nursing and pumping for two babies. They also needed lots of nutrition with their low birth weights, and I wanted to make sure they were getting full feeds and enough. Your mind plays lots of tricks on you during those early weeks.What did you early days of implementing routine/schedule look like? waking to feed, diaper change,nap, and do it all over again. There's not much waketime at the beginning, and it's not very exciting. We had to wake to feed at night up to 6 weeks which isn't the case for most people. How did following a routine/schedule evolve over the newborn weeks? I noticed they would begin to stir at the 3 hour mark during the day and it was easier to feed them when they would naturally wake. When we got permission to let them sleep at night, they would go about 5 hours. This was at 6 weeks old. We backed up bedtime and started a dreamfeed to ensure only 1 motn waking.Would you do it differently next time? Not much, what we did worked surprisingly well. I think just knowing what to expect (even if it doesn't happen the same way) will help a lot. I would be more in tune to naps and the nuances associated with them. I think they might help.Any words of advice? Just do your best. Keep to an EWS and work on naps, but if they don't work out, it's ok. Talk to the doctor if you're concerned, even if it's "silly". They get paid for it. Keep the environment low key. Overstimulation is so easy for babies.